On a dead still morning in January, roach are topping in the Ouse at Ten Mile Bank in Norfolk. The river is up and coloured after several days of rain, and there was a frost the night before. It’s often a bad sign when roach top in such conditions — but it’s a grand day to be outdoors. Today is only the second time Mary has visited this venue, and he’s really looking forward to fishing it. Opens are held here regularly in winter and are so popular they usually sell out immediately. This is because they are almost always won with double-figure bags of roach – fish of all sizes up to and over 1lb (0.45kg). A few weeks before, Mary was lucky enough to get a ticket for an Open here but was drawn out of it above the bridge. This morning he can fish wherever he wants, so he chooses a peg (permanent peg 193) below the bridge – the stretch where many of the best weights were taken in the match. Tackling up, he is still kicking himself for being so stupid the day before, when he fished a match on the Derbyshire Derwent. He didn’t come anywhere, but caught a splendid 2lb 9oz (1.15kg) roach, his best ever. He wanted to take a photo but couldn’t find anyone with a camera. So he put it back – only to remember his own camera in his tackle box! ‘It wasn’t like this when I was here before,’ says Mary, looking at the slightly swollen river. ‘Then it was just creeping through.’ He reckons his best bet today is to fish the slower, steadier water on the inside with the whip and pole. But first he has a few casts into the ‘crease’ at the edge of the main flow, some 10m (11yd) out, with a light 10ft (3m) quivertip rod, paternoster rig and single bronze maggot hookbait – simply to tell him how well, if at all, the roach are feeding. Straight away the fine tip rattles, but he misses the bite. Next cast, the same thing happens. Third time lucky, he hooks and lands a 2oz (60g) roach. ‘In a match you’d be happy to catch these all day,’ he says, popping it gently into the keepnet. It comes as some surprise that Mary’s rods and poles aren’t red – after all, most of the rest of his gear is. Even the frames of his glasses are bright crimson! Laughing, he admits he does in fact have two red rods at home. One Christmas his best pal, Evan McNeil, secretly borrowed the rods, painted them red and gave them back as a present! So what’s all this red business about? Mary explains that when he was just starting out, a few years ago, his friend Pete Hobson suggested he create a distinctive image for himself. At the time Mary used to wear a red beret when he went fishing, so he thought, why not wear all red? After all, most anglers go out of their way to avoid the colour, believing it scares fish. ‘But I worked on the theory that fish are colour blind,’ he says. ‘Watch a football match between Liverpool and Everton on a black and white TV and it’s the dark blue kit of Everton that stands out, while the red of Liverpool fades into the grass pitch background.’ Whatever the truth about fishes’ eyesight, Mary’s red garb can’t have scared too many fish away over the years, as he has caught more than enough of them to take him to the top in match fishing. Mary tackles up a 5m (16ft) whip with a 1.25g Olivette rig , to fish around 4m (13ft) out, where it is about 2m (6½ ft) deep. He sets the hook just off the bottom, above any lily stalks. Beyond the whip line the bottom shelves steeply. Plumbing up with the pole he finds about 3.5m (12ft) of water just this side of the ‘crease’, around 8m (26ft) out. He decides on 8m (26ft) of pole with a 2g Olivette rig , to fish to hand around 7m (23ft) out. 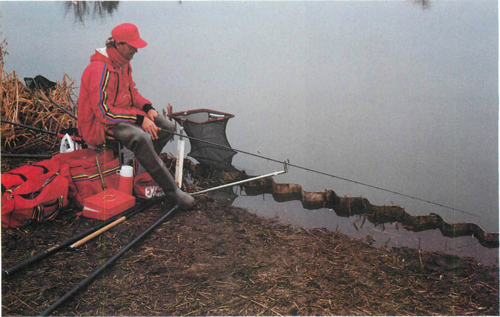 There are no lily stalks here so he sets the distance between hook and float at 3.5m (12ft), to fish slightly overdepth. After missing a few edgy bites, the float slides away positively and a hand-size roach comes to the net. Its ruby fins pale by comparison with its captor’s gear, but it’s a flawless fish all the same. Mark says the rain put a damper on sport here over the weekend, but that overall the venue has picked up amazingly in the past few years. ‘It wasn’t long ago we used to call this place Ten Mile Blank!’ he says. Tea break over, Mary tries the whip. The flow is steadier on this line and the bites come fractionally faster. But they’re all from tiny fish – roach, mostly, plus the odd skimmer – and he misses more than he hits. Mark says things should improve around mid-day when the sluice downstream at Denver is shut and the river backs up. In desperation, Mary picks up his quivertip rod, baits the medium-wire, micro-barbed 22 on a 1lb (0.45kg) hooklength with a bronze maggot, and flicks the bomb out about 15m (16yd). Judging by how long it takes to sink, it’s a good 6m (20ft) deep out there. He tightens up, then backwinds a touch so the line hangs slack from the tip. This is a highly sensitive method when con- ditions are as they are now — hardly any flow, and not a breath of wind. After a few moments the line twitches, then lifts. Mary strikes before the fish can feel the resistance of the tip and is soon netting a plump 8oz (230g) roach. Loose-feeding his new line regularly but lightly with hemp and maggots, Mary starts catching a much better stamp of roach than he was getting on the pole and whip – and more of them. ‘They must just be out in the deeper water, and want the bait dead still and hard on the deck,’ he says. He starts with a 60cm (24in) tail but hits more bites after shortening it to 50cm (20in). ‘I’m really enjoying this now,’ he says, netting another good roach. Mary ends up with around 5lb (2.3kg) of roach – not a bad catch by any means, given the conditions. As he’s getting ready to pack up, a local angler, Joseph Draper, stops by and tells him people have been catching well here recently fishing maggot on the hook but ‘shovelling in the hemp’. On hearing this, Mary says he’ll definitely feed more hemp next time. That’s a mark of a top matchman: never thinking he’s too good to learn from other anglers.